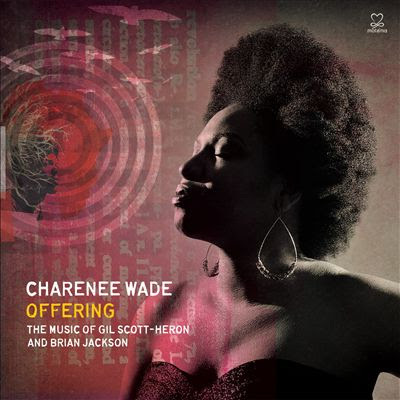 Charenée Wade’s album Offering takes ten songs from the towering body of work made by poet and songwriter Gil Scott-Heron (1949-2011) and his early musical partner, pianist / flutist Brian Jackson (b. 1952), and wrestles them into her own mellow poetry. There are few hits. No Johannesburg, Winter In America or The Bottle. Wade and her producer Mark Ruffin have chosen songs that give the album a reflective mood and contemporary resonance. Though the lyrics are heavy, the music is light on its feet, given extra wings on the six tracks featuring vibes player Stefon Harris, including the almost Ellingtonian arrangement of Song of the Wind. Wade’s diction, pitching and rhythmic élan are flawless, and she resists the temptation to over-indulge her impressive vocal technique. This is very much a jazz album, with supple acoustic bass (Lonnie Plaxico) and airy drums (Alvester Garnett) and a studio production that favours the rhapsodic over the funky. Wade states in her sleevenotes that the choice of material was informed by ‘issues that unfortunately still need to be addressed today’. She continues: ‘even in the light of some progress that has been afforded us by the miracle of the first brown president of the United States, there are still so many struggles revealing that our work is not yet done.’ Her polemical intention is emphasised by Christian McBride’s spoken-word intro for Peace Go With You Brother and the melancholy, Mingus-like arrangement of Essex/Martin, Grant, Byrd & Till, with a lengthy passage declaimed by actor Malcolm-Jamal Warner. These tracks promise to veer in the direction of Terence Blanchard’s Breathless, which also features words that reflect on similar concerns in the US. But Blanchard’s album maintains a more uplifting and consistent spirit – when taken as a whole, Offering is a little less coherent. It demonstrates – quite understandably – that the music of Scott-Heron and Jackson is difficult to re-interpret, lyrically and musically, but that it is worth the effort. The dark, eliptical humour of the originals may be impossible to replicate, but on songs such as The Vulture [Your Soul and Mine] and in her sardonic reading of Ain’t No Such Thing As Superman, Wade excavates Scott-Heron’s matchless repertoire to find new meaning. Personally speaking, I was also glad of the excuse to rediscover the original songs, and that is a very generous gift, a valuable ‘offering’, to receive from the talented Charenée Wade.